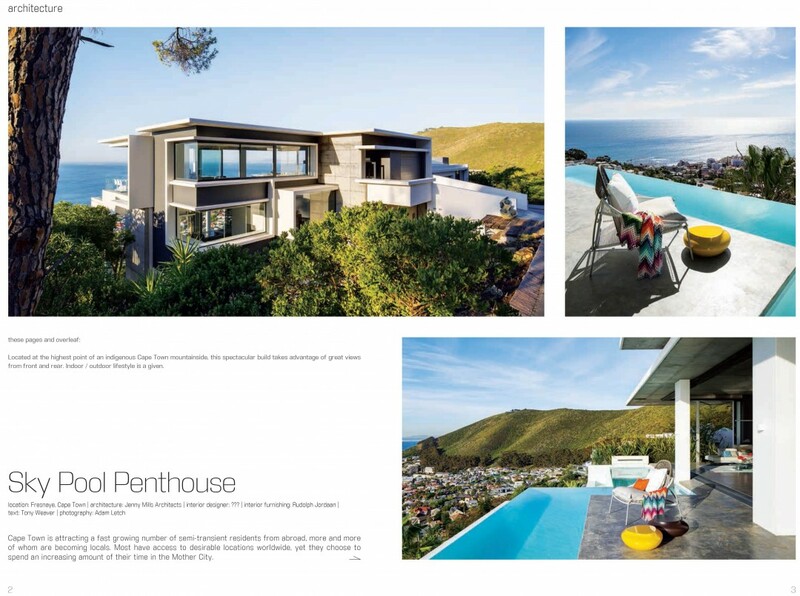 A HILLSIDE HOME FOR ONE OF CAPE TOWN’S ‘INTERNATIONAL LOCALS’. Cape Town has a fast growing number of semi-transient residents from abroad who more and more are becoming ‘locals’. Most have access to desirable locations worldwide, yet they choose to spend much of their time here. And it’s not hard to see why – in July this year, Cape Town topped Travel and Leisure’s list of the world’s top cities to visit, just the latest in its many other accolades. 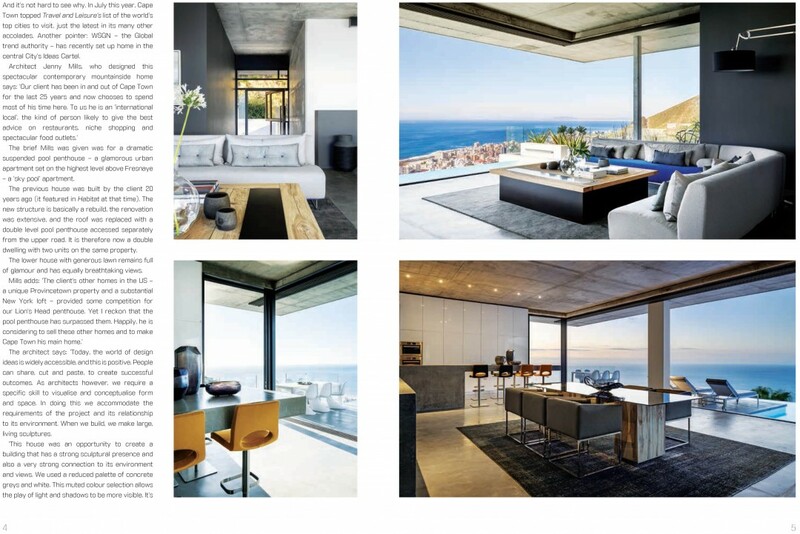 The brief Mills was given was for a dramatic suspended pool penthouse – a glamorous urban apartment set on the slopes above Fresnaye - a ‘sky pool’ apartment. The previous house was built by the client 20 years ago (also featured in Habitat at the time). This house was basically rebuilt, the renovation was so extensive, and the roof was replaced with a double level pool penthouse accessed separately from the upper road. It is now a double dwelling with two units on the same property. Mills adds that “the world of design ideas is widely accessible, and this is good. People can share and cut and paste with very successful outcomes. As architects, we however, have a specific skill to visualise and conceptualise form and space. In doing this we accommodate the requirements of the project and its relationship to its environment. When we build, we make large, living sculptures. “This house was an opportunity to make a building that has a strong presence as a sculpture and also a very strong connection to its environment and views. We used a reduced palette of concrete greys and white. This muted colour selection allows the play of light and shadows to be more visible. 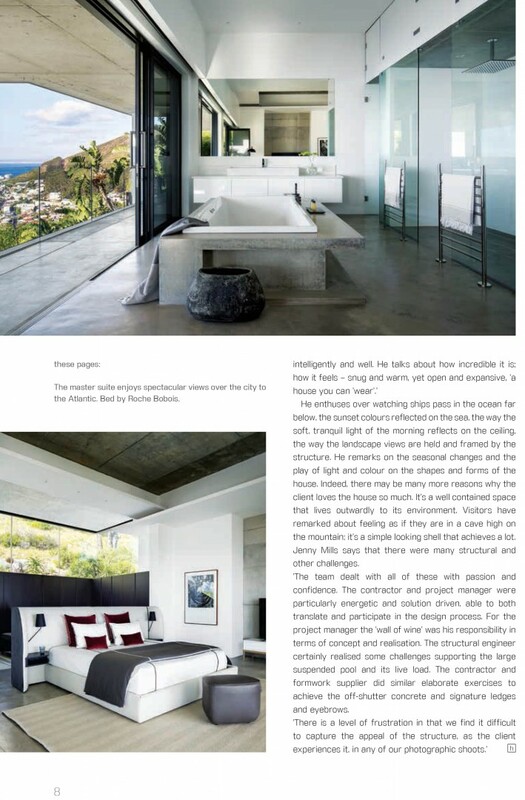 “It is a dynamic composition of massive horizontal and vertical planes of concrete, glass and plastered surfaces. External light plays are exquisite, internal lighting in the evenings an enhancement beyond expectation. From the upper road one can look straight through the house with the horizon line of the sea virtually uninterrupted. The house has a transparency. The glazed panel in the living room that frames the view of Lion’s Head has a similar one in the dressing room of the main bedroom. The landscape is consistently present. Great care was taken to favour the mountain view as much as that of the sea. 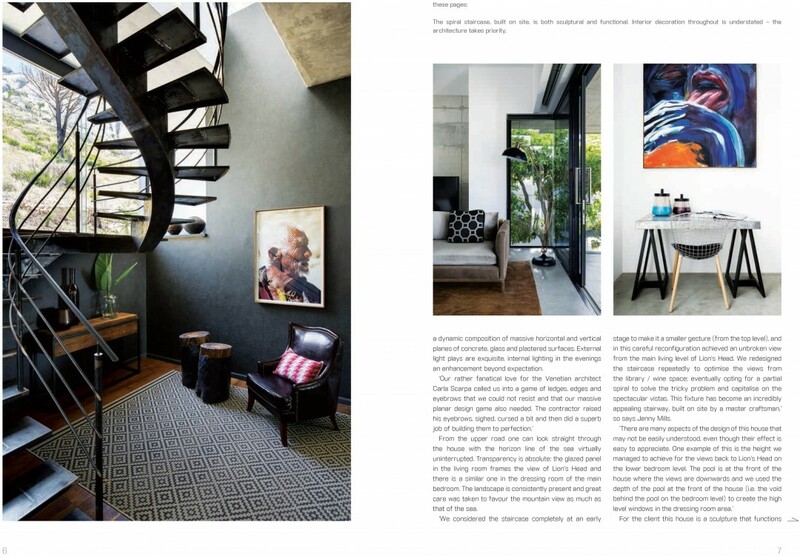 “We redesigned the staircase completely at an early stage to make it a smaller gesture (from the top level) and in this careful reconfiguration achieved an unbroken view from the main living level of Lion’s Head. We redesigned the staircase again and again to optimise the views from the library/wine space; eventually opting for a partial spiral to solve the tricky problem and gain the beautiful Lion’s head views. It also became an incredible staircase, built on site by a master craftsman,” says Mills. For the client this house is a sculpture that functions well and with intelligence. He talks about how incredible it is, how it feels - snug and warm, yet open and expansive, a house you can ‘wear’. He talks about what a pleasure it is to sit and watch ships pass in the ocean far below, the sunset colours reflected on the sea, the way the soft, tranquil light of the morning reflects on the ceiling, the way the landscape views are held and framed by the structure. 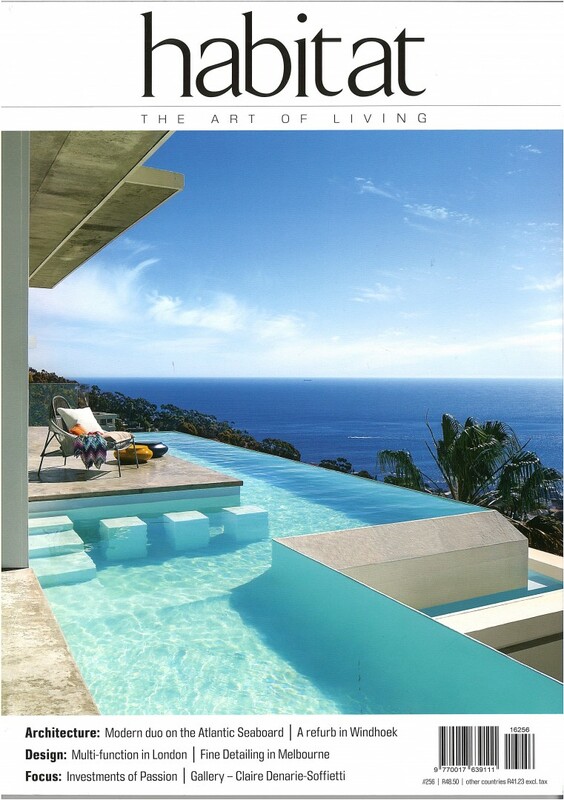 He remarks about the seasonal changes and the play of light and colour on the shapes and forms of the house. There may be many more reasons why the client loves the house so much. It’s a well-contained space that lives outwardly to its environment. Visitors have remarked about feeling as if they are in a cave high on the mountain, a simple looking shell that does a lot. Jenny Mills says that there were many structural and other challenges. “The team dealt with all with passion and confidence. The contractor and project manager were particularly energetic and solution driven, able to both translate and participate in the design process. For the project manager the ‘wall of wine’ was his ‘baby’ in terms of concept and realisation, a showstopper. The structural engineer certainly had some challenges supporting the large suspended pool and its live load. The contractor and formwork supplier did elaborate dancing exercises to achieve the off-shutter concrete and signature ledges and ‘eyebrows’.